LATHAM, NEW YORK (June 12, 2018) – Leading Data Center and Cloud Hosting Solutions provider TurnKey Internet, Inc. announced today the completion of power and infrastructure upgrades to its flagship Data Center in New York’s Tech Valley Region. The expansion increases total capacity of the New York data center with two additional cold containment pods with over 2500 additional server capacity and includes Tier IV features with all-new redundant cooling and backup power systems to meet the growing demand for Colocation and Cloud solutions. TurnKey Internet’s latest expansion to its flagship New York Data Center continues to strengthen the company’s enterprise-class cloud-based infrastructure, which currently provides solutions to clients in over 150 countries. The expansion not only increased total capacity, but also upgraded and added Tier IV features to their Albany Data Center with a fully redundant and independent 2N Generator System that sources from multiple fuel systems, flowing through multiple ATS (Auto Transfer Switch) systems. On top of the existing N+2 Redundant Cooling systems, the new upgrades allow TurnKey’s facility to operate at the highest level of redundancy and reliability possible. Constructed in 2012, TurnKey Internet’s New York Data Center leverages state-of-the-art green technologies, such as Cold-Containment Pods, smart-aisle cooling technology, and high voltage efficient power delivery systems. The facility maintains a zero carbon emission footprint by sourcing hydroelectric power through Governor Cuomo’s ‘ReCharge NY’ Program and using its advanced on-site solar power array. The facility is among the most energy-efficient data centers world-wide. In 2013, the facility was the 2nd in New York to be designated as an ENERGY STAR® certified data center by the United States Environmental Protection Agency (EPA). In 2013 the New York State Department of Environmental Conservation awarded TurnKey Internet an Environmental Excellence Award for the cutting-edge green design and operation of the 100% non-fossil fuel consuming sustainable data center. LATHAM, NEW YORK (April 17, 2018) – To celebrate Earth Day, leading Data Center and Cloud Hosting Solutions provider TurnKey Internet, Inc. announced today that it has been awarded and certified by the Green Business Bureau™ and Green America™ for its green initiatives and commitment to the environment. TurnKey Internet’s green data center utilizes state-of-the-art technology and 100% renewable energy to provide the greenest cloud-based IT services for clients all over the world. In anticipation of Earth Day, April 22nd, TurnKey Internet plans to amplify awareness for their low-energy, low-impact IT solutions. TurnKey Internet will run an Earth Day promotion for the entirety of April to honor their commitment to the environment. Their New York data center offers revolutionary green IT solutions, such as employing low-voltage servers stored in ultra-efficient cold containment pods in each section of their data center. These pods deliver precision spot-cooling to temperature-regulated server racks, which use thirty-three percent less energy than traditional data centers. TurnKey Internet runs their Energy Star certified facility with 100% renewable hydro and solar power. Their state-of the art data center is equipped with on-site, rooftop solar panels, and uses hydro-power from Niagara Falls to further supplement their renewable energy initiatives as beneficiaries of Gov. Cuomo’s “Recharge New York” power program. In 2013, The New York State Department of Environmental Conservation awarded TurnKey Internet the Environmental Excellence Award in recognition of their innovative data center design and outstanding commitment to environmental sustainability, social responsibility and economic viability. LATHAM, NEW YORK (November 15, 2017) – Leading Datacenter and Cloud Hosting Solutions provider TurnKey Internet, Inc. announced today the launch of their all new Refer-A-Friend program combined with the launch of their 2017 Black Friday Deals offering some of the best cloud servers, dedicated servers, and web hosting offers for 2017. TurnKey Internet is known for running its eagerly-awaited, industry-leading deals and specials, and this year is no different. 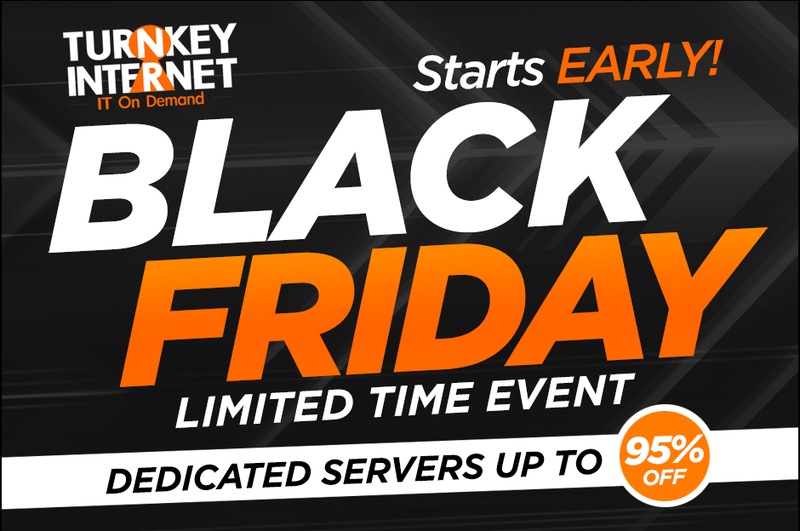 TurnKey Internet is offering up to 95% off for life on nearly every product they offer – Cloud Servers, Disaster Recovery Backup Services, Cloud Storage, Dedicated Servers, Virtual Private Servers (VPS), cPanel Web Hosting, Microsoft Windows Web Hosting, Enterprise Colocation Services, SEO Optimized Web Hosting, and much more. More information can be found at https://turnkeyinternet.net/holiday/. In a bold move in contrast to other companies that exclude or limit their best seasonal deals from existing clients – TurnKey is rewarding existing clients with a loyalty bonus. The loyalty bonus is applied as a free month of service for every previous year of loyalty when purchasing any new services during this Holiday promotional period. This gives existing clients access to deals greater than 95% off when factoring in the free loyalty bonus months of service included.